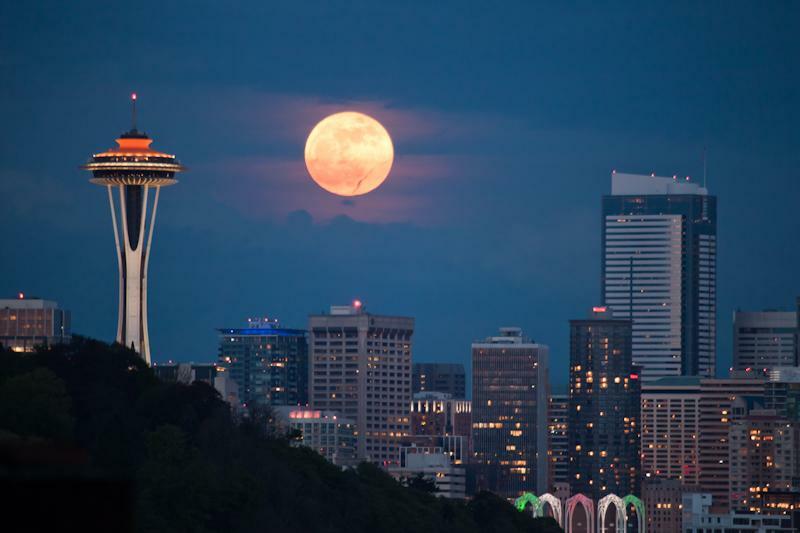 Another break in the usual Seattle spring weather gave me the oppurtunity to photography the Supermoon rising behind something interesting in the area. My first choice was Three Fingers. There's a wonderful piece of software out there called "The Photographer's Ephemeris" which helps you locate the best position to photograph the sun or moon as it rises or sets. It even allows you take in to account the amount of time it takes to rise over a foreground hill or mountain. After finding a promising spot for Three Fingers near Mount Vernon, Google Earth showed me that my spot didn't actually have a line-of-site view of the summit. Darn. My next choice was Mt. Pilchuck, but further investigation also didn't reveal a suitable site. 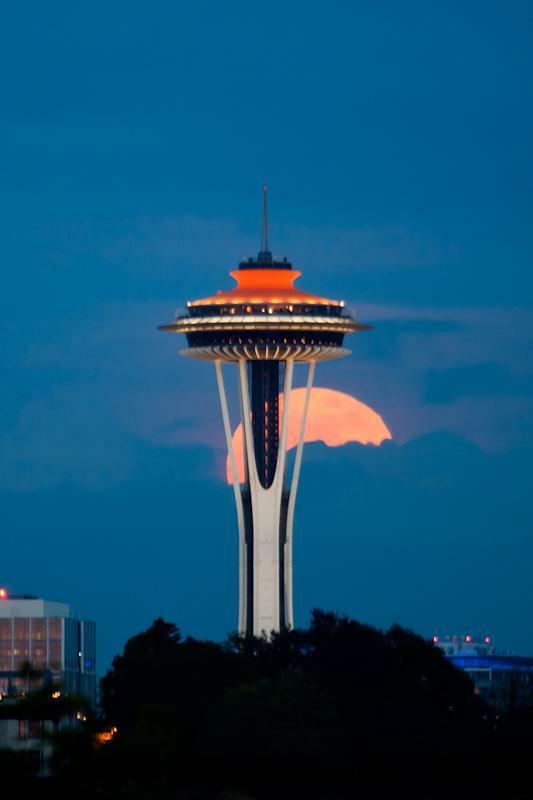 I then realized that I have always wanted to get a rise of the moon behind the iconic Space Needle, so once again TPE led me to a number of candidate sites. The trick is trying to determine the altitide of the moon as it coincides with the height of the Needle from a given location. Another consideration for me was to get the largest possible moon adjacent to the Needle which meant getting as far away as possible. TPE positioned me at a location on Magnolia Hill. 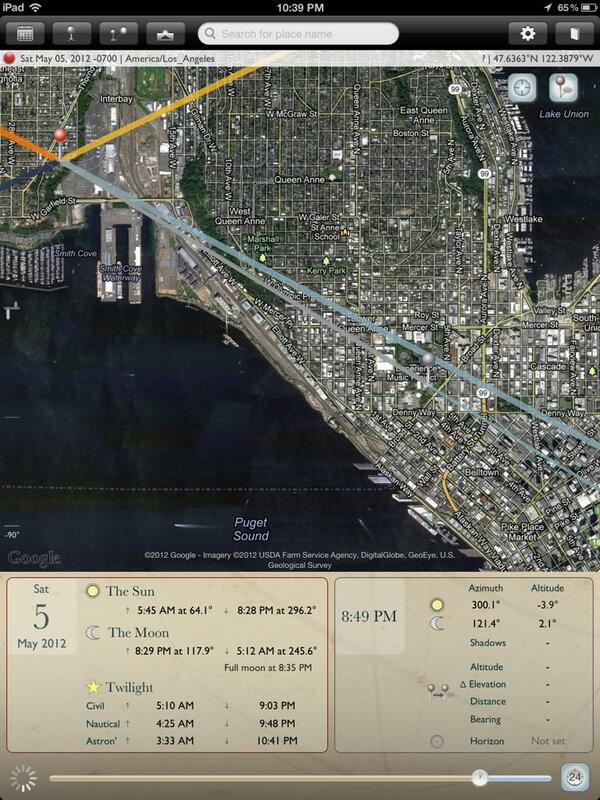 After confirming visibility of the Space Needle with Google Earth, all the pieces were in place except one: the weather. I used the Space Needle's own webcam to keep an eye on the eastern horizon, which had some cloudiness most of the afternoon. As the evening approached (moonrise was set for 8:35pm) I keep refreshing the camera and also stepping outside to verify the cloud were in fact disappating in the east. Finally, at 7:40pm I was satisfied they were low enough that the moon would still rise for the shot. I jumped in the car and headed to the location. I investigated a few other sites near the Magnolia bridge before finally heading to the spot that TPE had revealed. There were dozens and dozens of photographers positioned on the west end of the bridge as well as at the Ursula Judkins viewpoint. I continued about 5 blocks to my spot and set up. 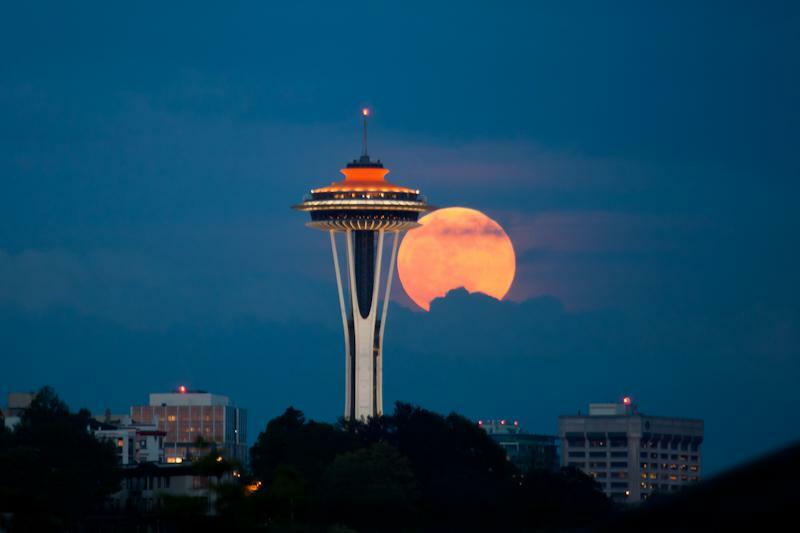 There were still some low clouds, and after a few test shots, the disc of the moon stated to reveal itself and soon was rising, right behind the Space Needle. TPE had picked the right spot! Another useful tool for IOS is the app called "Theodolite" which allows you to use the internal tilt sensors of the iphone/ipad to look up the elevation and angle of a distant item, allowing you to line that information up with the data in TPE. So I snapped away and came away with several great shots. Unfortunately, my tripod head's baseclamp has a loose screw, so every snap of the shutter yielded a minute amount of vibration of the whole mount, so unfortunately, ths shots are a little softer than I would have hoped. I hung out a little bit after realizing this was also an idea spot to capture KSEA approach traffic passing in front of the moon, however, none of the arrivals lined up. I will be back to this spot again for that!